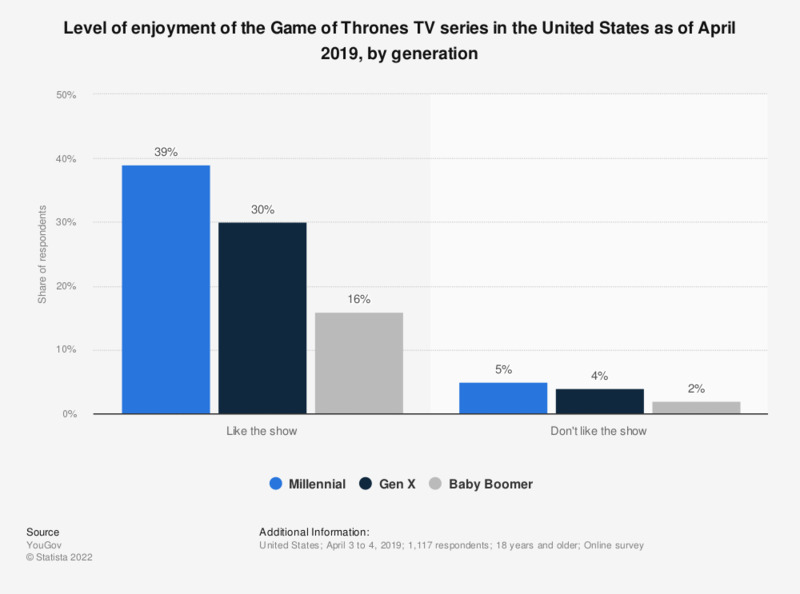 This statistic shows the level of enjoyment of the Game of Thrones TV series in the United States as of April 2019, by generation. A total of 39 percent of Millennials stated that they liked the show, compared to just five percent who did not like the TV series of Game of Thrones. This question was phrased by the source as follows: "Which ONE of the following BEST describes your level of fandom, if at all, for the Game of Thrones TV show?" Statistics on "Game of Thrones"
Game of Thrones Season 7: which, if any, of the following major characters do you think is likely to die next? Game of Thrones: if an election were held tomorrow, who would you vote for to rule from the Iron Throne? How often do you engage in the following fandom practices? Which of the following shows nominated for best comedy series do you think should win the Emmy? Which of the following shows nominated for best reality competition series do you think should win the Emmy? Which of the following shows nominated for best variety talk series do you think should win the Emmy? Which of the following shows nominated for best drama series do you think should win the Emmy? Which of the following people nominated for best comedy actress do you think should win the Emmy? Which of the following people nominated for best comedy actor do you think should win the Emmy? Which of the following people nominated for best drama actress do you think should win the Emmy? Which of the following people nominated for best drama actor do you think should win the Emmy? Which of the following shows nominated for best limited series do you think should win the Emmy? Which nominee would you vote for in the 2019 Golden Globes category Best Television Limited Series or Motion Picture Made for Television? Have you ever watched This Is Us?